To improve its efficiency and profitability, and to secure customer satisfaction, CFAFG needed a comprehensive solution capable of covering the entirety of its training business from order to invoice. 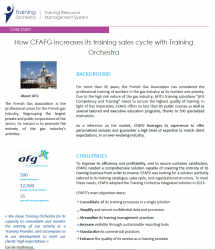 CFAFG called on Training Orchestra to solve its global training logistics needs and enhance its training sales cycle. The brochure provides an overview of CFAFG’s specific business goals as a training provider in a high-risk industry, and how Training Orchestra’s sophisticated scheduling, reporting, and compliance tools helped address these complex business challenges.